On Earth Day, scientists and their supporters will be marching in DC and throughout the country to counter the anti-science climate change deniers who control the federal government and are gleefully seeking to destroy the EPA and bail out the fossil fuel industry. The need for action by state and local governments – and the leadership of grassroots activists – is more urgent than ever. The question for New Yorkers is “is the state doing enough?” The clear answer, sadly, is no. The state is moving in in the right direction – but far too timidly to play a true leadership role in avoiding catastrophic climate change. Government action in NY is nowhere near the level of a WWII type mobilization called for in the current national platform of the Democratic Party. While credited with having among the strongest climate change agendas among the states, Cuomo’s proposals largely build out the Executive Order on climate change that was issued in 2009 by Governor David Paterson. A far more ambitious agenda is now needed. The Governor continues to believe that the “market” – which has driven climate change – will now solve the problem, given some incentives and nudges by the government. The Governor now understands that climate change is caused by burning fossil fuels. Strong grassroots pressure moved the Governor to halt several fossil fuel projects. New York’s budget includes several hundred thousand dollars for research on regenerative agriculture. New York has approved Community Choice Aggregation, where residents and governments can choose what type of energy mix they purchase. 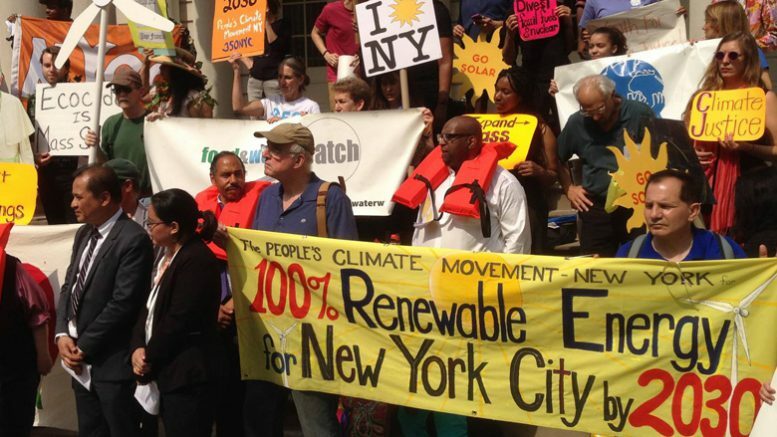 The Governor announced a study to see how fast NY can transition to 100% clean energy (the Jacobson study five years ago by Cornell and Stanford professors said 2030). New York and the federal government have been very slow to promote the development of offshore wind. The Governor has refused to put money on the table to purchase offshore wind, even though the ocean off of Long Island and NYC is considered the Saudi Arabia of offshore wind. The Governor has finally put out some modest goals for offshore wind (2400 MW by 2030), far less than the firm commitments sought by advocates. But it appears that the European energy companies which have developed offshore wind at dramatically decreasing costs have decided the potential profits are so great that they are jumping into NY. Cuomo put $7.6 billion on the table to bail out a handful of old upstate nuclear plants that are losing money; that subsidy for a dirty, environmentally unsafe energy source exceeds his commitment to renewable energy. While the Governor has stopped fracking, he views natural gas (and methane, a far more potent greenhouse gas) as a cheap “bridge” fuel to a clean future. The Governor recently undermined the nascent solar industry, siding with the utility companies in moving away from the payment system known as net metering. While the Governor’s action makes economic and planning sense long term, it was a puzzling move when solar is still struggling to get a foothold in New York. The state has not modified its goals following the success by the developing world at COP21 in Paris to get the industrial polluters like the US (and NY) to agree to lower the target for global warming from 2 degrees C to 1.5 degrees. This change requires a doubling of the speed of reducing greenhouse gas emissions to 7 to 9% a year. The industrial countries that have caused global warming are in the more temperate zones. The poorer nations – which are the victims of industrial pollution – tend to be closer to tropics; they are less able to handle the rise in temperature or surging sea levels. Recent studies conclude that they will begin to experience catastrophic climate change by 2020. NY needs to say no to any more fossil fuels and instead significantly ramp up its goals and financial support for renewable energy. Even industry representatives believe the resources Cuomo has committed to renewable energy is far less than needed to make even the limited goal of 50% of the state’s electricity from renewables by 2030 (and electricity accounts for only ¼ of the state’s carbon footprint). The state under Governors Pataki, Spitzer, Patterson and Cuomo fell way short of its prior goal of 30% of its electricity by renewables by 2015. NYS needs to promote mass transit and quickly move to all electric vehicles. It needs to require buildings to be retrofitted to eliminate their carbon footprint. It needs to move to a sustainable, non-fossil fuel based agriculture system. It needs to work with local governments to speed up the development of local renewable energy systems that address environmental and community concerns (local opposition to wind and solar farms is a big barrier). It needs to support a Just Transition, targeting disadvantaged communities that will suffer the most harm from climate change while providing support to workers and communities presently reliant upon fossil fuels. Energy should become a common good, community owned and democratically controlled. The state should divest its pension funds from fossil fuels. And Attorney General Schneiderman deserves support for his efforts to investigate Exxon and the fossil fuel industry for promoting climate denial even thought their scientists knew it was real. New York officially now says the sea levels may rise by as much as 6 feet by 2100 and the temperature by as much as an astonishing 14 degrees F. Some scientists who have studied the actual melting of the world’s ice shelfs believe that the sea may rise by as much as 9 feet by 2050. Goodbye NYC. Transitioning to 100% clean energy. It won’t be cheap, and requires a significant infusion of additional funds missing from the state (and federal) budget. One way to pay for the transition would be a robust carbon tax. We cannot afford the litmus test for politicians to be that they believe in climate change and support the development of renewable energy. They must commit to a program that will avoid catastrophic climate change. Advocates must be willing to say that we need more sooner. The path to 100% clean energy – a Green New Deal – is also the path to full employment, a healthier life and lower electric bills. Everyone will win – except the CEOs of the fossil fuel industry.